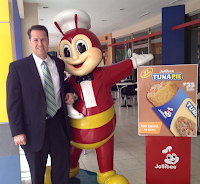 Earlier this week, I took my first business trip outside of Singapore and therefore outside of "Asia lite" and into "real Asia" - Manila, in the Philippines. I didn't really know what to expect in the Philippines, and was both pleasantly surprised as well as disturbed by the experience. The country has far more poverty than Singapore and far greater pronounced poverty than the US. It's obvious that there is a huge gap between the wealthy and the rest of the country who have very little. However, based on where I was staying during the week, the drive from the airport via taxi was my first, and only, real glimpse of just how much there is. A few minutes later, however, the scene changed dramatically as we approached Makati, one of the business districts of Manila. 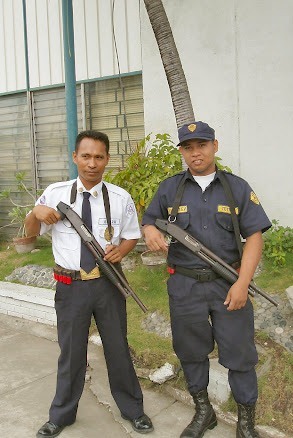 The Ayala family, Philippines billionaires, own a vast majority of real estate in the area and apparently have gone to great lengths to protect their property against crime and terrorism - in particular after a 2007 bombing in one of the more popular malls in the city. The photo to the right is an example of what you see outside almost every major hotel or office building - armed guards who check just about every bag that comes in and out of the doors of the building. Most buildings also have a dog sitting outside, I assume providing extra warning against explosives. 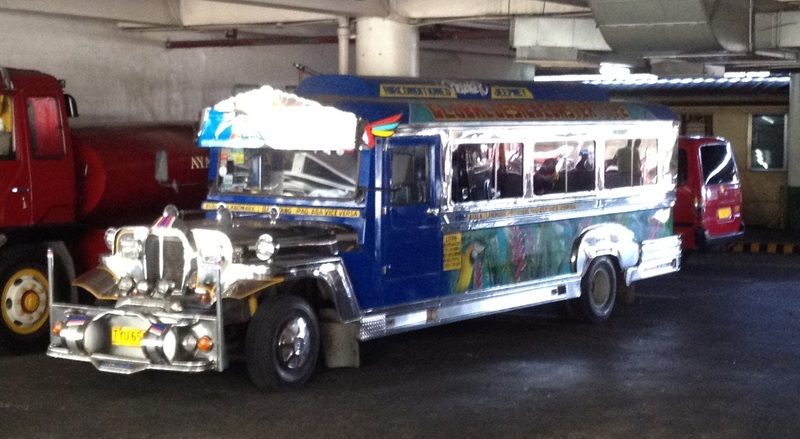 Another local icon of the Philippines is the Jeepney! 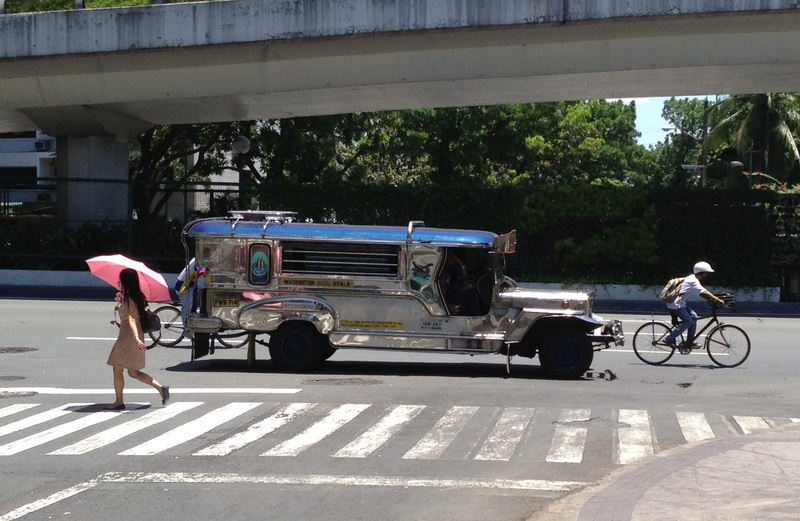 This common form of public transportation can be found all over Manila, and most of the Philippines I'm told. They originated from left over US military Jeeps, but have obviously gone through some major transformation to become what they are today. Unfortunately, I was told they are a dying breed because they consume about the same amount of fuel as a modern bus, but carry 1/4 of the passengers. They really add some unique character to the busy streets of Manila and if they are going away, I'm glad I got to see...and dodge......a few of them while I was in the city. To conclude this week's update about the Philippines, however, I would be remiss if I didn't share the experience of my final night in Manila. Following a very succesful customer event and press meeting, I took five local SAP marketing team members to dinner in the area known as Greenbelt. This is the touristy, business district area of Makati, but was recommended by a few local people for good restaurants. Dinner was good, but the visit to the Hard Rock Cafe in Manila was the real experience. Apparently, Filipinos really enjoy live music....and San Miguel beer......and margaritas. 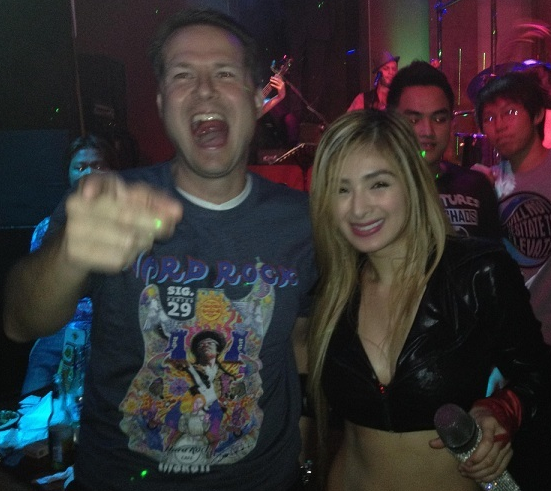 This photo is evidence of how both interacted with me at the Hard Rock Cafe, where we saw the "Mocha Girls" perform live. (yes - that's a Mocha Girl, and I'm wearing a Hard Rock Cafe t-shirt that was purchased for and given to me just seconds before this photo was taken). Needless to say, it was a very enjoyable final night in the Philippines with co-workers, but I was very pleased to touch down in Singapore the following day. I'm even more excited, as a write this, that I have only 3 days until I board a plane to head to the US to see you all and prepare to bring Jennifer and kids along with me back to Singapore! In a country as structured and safe as Singapore, it may come as a surprise that there are opportunities here to take a "risk". No, I'm not talking about going out for the day without an umbrella or ordering food at the hawker center without knowing what kind of "meat" it is - though these do represent some serious potential risks. No, I'm talking about good old-fashioned gambling and I decided to write about this tonight because I spent the weekend "gambling" in two different ways. Saturday - I made the trip from Singapore to Johor Bahru, Malaysia, with a few co-workers and new friends. I mention this as a "gamble" only because most Singaporeans insist you're gambling with your life if you go to Johor Bahru. I found it no more threatening than a night out in Philadelphia. (well, you judge how much of a gamble that is) I was, as far as I could tell, the only Caucasian within 20 or 30 miles of where we had dinner, but it really didn't bother me. 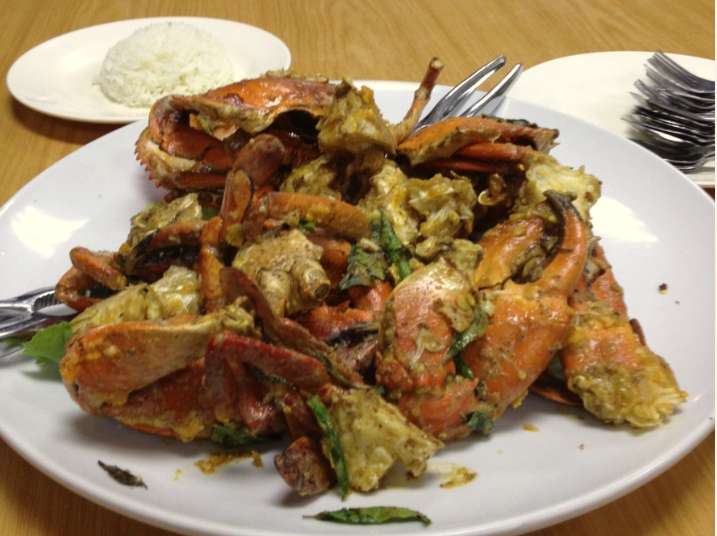 Dinner was casual, a lot of fun, and included Beef and Chicken Satay, Salted Egg Crab, Steamed Whole Catfish, and my new favorite, Pork Knuckle. The restaurant was what they call a "coffee shop", which is very common in Malaysia. It was open air and full of locals - most eating as families around small, flimsy wooden tables, drinking ice-cold sour plum and lime drinks, periodically laughing at the Chinese comedy / drama that was playing on the TV on the wall. It was about a 90 minute drive, dodging motorbikes, to get to Malaysia, through customs, and to the restaurant, but it was a unique experience and well worth the trip. I have several hundred Malaysian ringett, a few more stamps in my passport, and a new appreciation for just how spicy the chili crabs are here in Asian. Sunday - I decided I would try some more traditional gambling. From what I've discovered so far, there are three "legal" forms of gambling in Singapore. To date, I've tried only one.....but my time here has just begun! 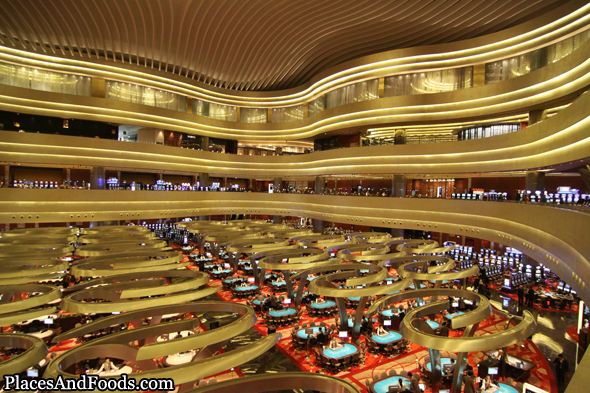 There are only two casinos in the country (Marina Bay Sands and Resorts World Sentosa), but they are large and pretty amazing. The Marina Bay Sands is slightly smaller than the MGM - which is the largest casino floor in Las Vegas - the MBS is fairly large. 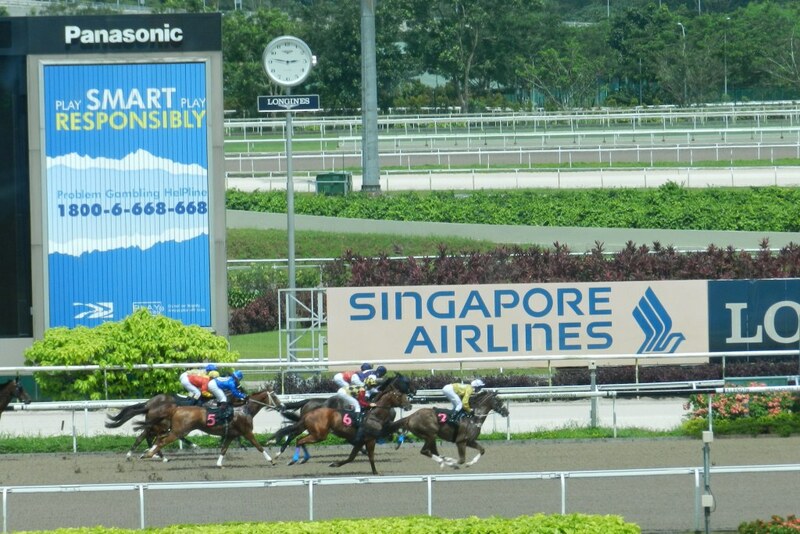 What I find most interesting is the country's policy on Singaporeans gambling in the casinos. It turns out that citizens must pay $100 to enter the casino, or an annual fee of $2,000 for unlimited entry for one year. For foreigners, just show your passport and they are more than happy to take your money from you the old fashioned way at the table vs. the casino door. really isn't a ton of professional sports played in Singapore. The "Singapore Pool" is the equivalent of a sports book in the US. You can place wagers on motor sports, football, etc. at any one of the more than 300 "Singapore Pools" scattered all over the island. 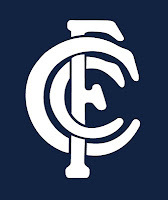 Of course, for me, I was very happy to see that my bovada.lv account still works here in Singapore, so I've been able to bet on my new favorite "local" sport - the Australian Football League - from the comfort of home. (I would have noted the online account as a 4th "legal" form of gambling, but I'm not sure if it's even legal in the US, let alone here). I've adopted the Carlton Blues as "my team" while here in Singapore - so feel free to follow along from home via yahoo sports, etc. I've been looking forward to a day at the track all week - and I was very pleased that the weather was cooperating. In fact, I didn't even take an umbrella on this trip (ok, I actually forgot it), but I didn't need it. What made it especially interesting were two things. The race call was broadcast in English in one half of the club, while the other half was in Mandarin - so you had to choose your seat carefully. Truth is, I'm kind of superstitious when I bet on the horses (go to the same bet window every time if I'm winning, for example) - so after winning my first two bets sitting in the Mandarin section, and losing the next bet while sitting in the English section - I quickly moved back and listened to the Mandarin race call......unfortunately, my luck didn't change with the move. The fans were crazy! Aside from cheering on a Triple Crown hopeful at Belmont, I've never heard more enthusiastic fans at a race. 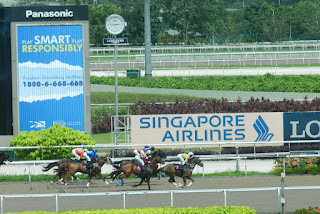 Every few minutes there would be a roar of screaming and arm waving as people watched simulcast races from Malaysia - followed by even more screaming when the live races went off in Singapore. It really made for an exciting day at the races. Thanks to a couple exacta winners, I did win enough to cover all my bets, the cost of a couple beers (a great deal at $4 each), and my entry fee - all in all, a pretty successful day at the track. 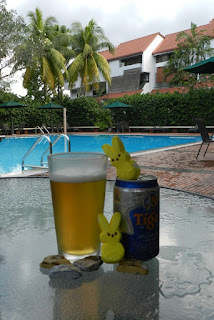 This was my first holiday in Singapore - not counting St. Patrick's Day - and thanks to Sue and Carmen DeVito's invitation to dinner, I felt right at home. Well, except for the fact that I'm halfway around the world and none of my own family was there. Honestly, I can't thank Sue and Carmen enough for welcoming me into their home. It was a really great way to close out a weekend that had me all over the small island of Singapore. Easter in Singapore isn't all that different from the US, except that very few things are actually closed completely. The diversity of religions is evident and nearly all stores, restaurants, etc. operate just like any other day. And because there is a pretty large population of American and European expats, the grocery stores have a small selection of the Easter candy you'd find at any local US store. What was surprising to me was the number of places, namely the large malls, where special activities were available for kids to color Easter eggs and make Easter related crafts. No Easter bunny photo ops, however, otherwise the photo to the right would have been much more entertaining. In addition to Easter dinner with the DeVito's, I spent the weekend preparing a few things for my trip back to the US and the arrival of Jennifer and the kids. I know that seems a little crazy, considering it's more than two weeks away, but my workload the next two weeks is worse than usual, including four days in Manila the week of April 16. It won't be very exciting for any of you to hear the details, but one task I was happy to cross off the list was figuring out how to get dehumidifiers to run while I'm away. Not very exciting, but required considering the 99% humidity every day - otherwise, we'd come back to a home full of mildew. Aside from that, I did get to see some new parts of the island. 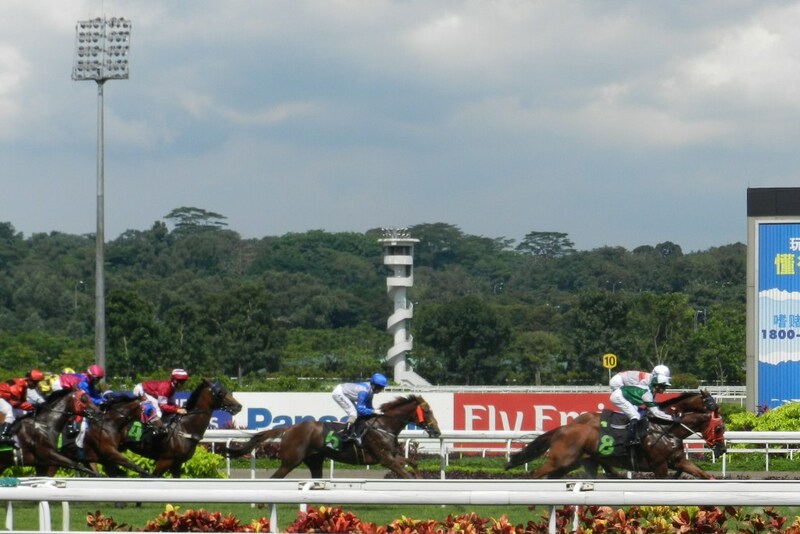 Here are a few highlights from two of my "adventures"....Mustafa Centre and the Handa Singapore Classic. In general, Singapore is very organized, structured, and controlled. (see my "following the rules" post). You can throw all of that out the window when you're in Little India where there's little rhyme or reason to anything. No place is this more evident than Mustafa Centre, the largest shopping mall in this part of town. I don't know if I would call it a mall - rather - it's one giant store spanning the equivalent of the inventory of Walmart, Home Depot, Office Depot, Barnes and Noble, Dicks Sporting Goods, and a grocery store. The crazy thing about this place is that it is five floors tall, but not near large enough to fit all the stuff offered for sale. There's everything from furniture, DVDs, health and beauty supplies, traditional Indian clothing, souvenirs, sporting goods, a custom tailor, jewelry, and a full grocery store. And that's just scratching the surface. But that's not what makes it odd......what makes it odd is that you'll find a $7500 Tag Heuer watch in a display case next to a shelving unit full of DVDs, spray deodorant and 25 pound bags of rice. There's basically no logic to what is where, which is what adds to the "fun" of shopping at Mustafa's. Oh - and it's hot, kind of dirty, crowded, and the aisles are at most 3 feet wide, so you practically have to walk sideways through the store -which is what makes it not fun to shop at Mustafa's. It's just madness, and something you have to see to fully comprehend...which you will if you come visit! 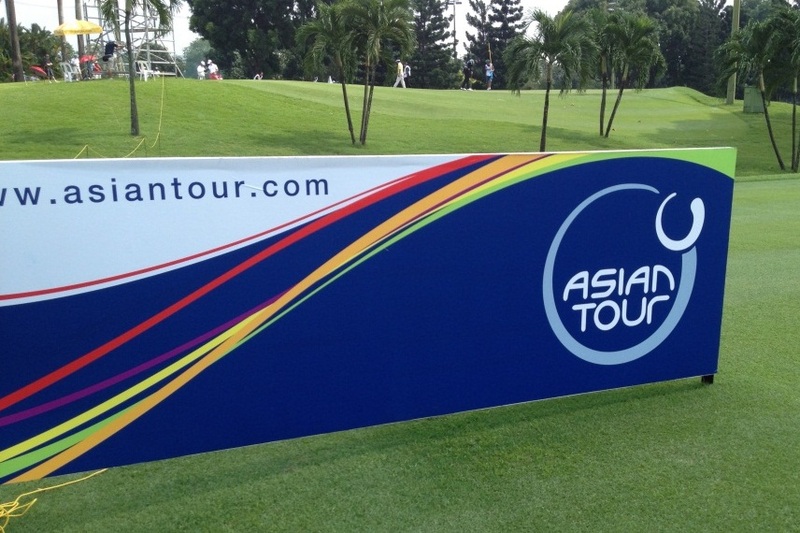 On the complete opposite end of the spectrum is the Orchid Country Club, where I enjoyed a few hours watching the Asian Golf Tour play the 3rd round of the Handa Singapore Classic. A co-worker offered me tickets, so I decided I would check it out. Not quite the Masters, but I didn't complain about a nice afternoon of walking around a beautiful golf course and seeing some pretty good golf. Located about 30 minutes away from home, I got a glimpse of the northern end of Singapore, where you really see the tropical rain forest that Singapore was built upon. It's very green, very wet, and there's a lot of open space. There are two things you'll probably note in these pictures from the course. 1) There's little to any crowd attending the tournament. 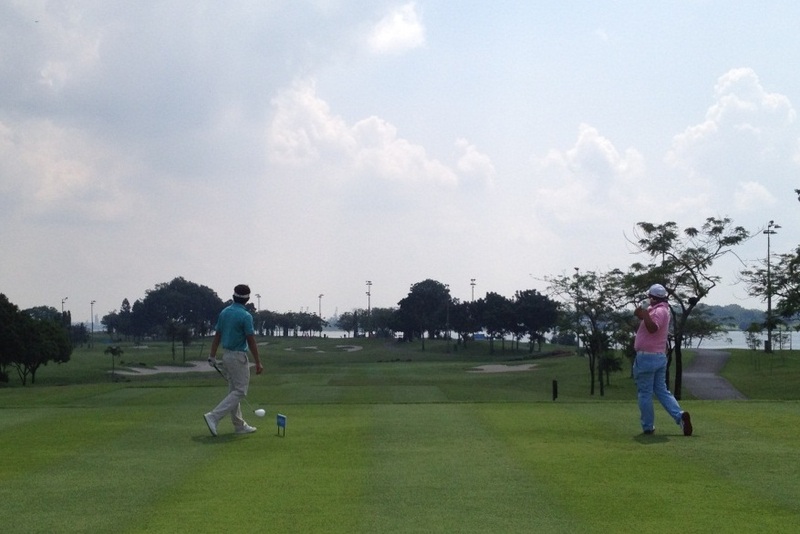 2) This beautiful country club, like most others in Singapore, has lights on every hole! Apparently members take advantage of early morning and late evening golf when the temperature is much cooler. What you can't see from the pictures is just how accessible the players are. In fact, when I arrived at the course, I was directed to walk down a set of steps where I found the players locker room and about 40 players enjoying lunch with their families on the outdoor patio. Bags of clubs were set right next to the tables and caddies mingled with each other before heading to the practice range with their players (to hit off the artificial grass matts). Bottom line - a very different experience than what I have witnessed at the PGA, US Open, etc. in the United States - but the golf was pretty good overall and it made for an enjoyable day. So, that's another weekend for me in Singapore. Tomorrow, I'm back to the office and continuing the countdown (now only 17 days until I'm back in the US to see family and friends). I hope you all enjoyed a good Easter and I look forward to seeing you all soon. Getting "Localized" & Going to Hell! After about one month in Singapore, my co-workers have told me I'm getting "localized", referring to my daily use of public transportation, eating at the hawker centers, and overall willingness to step outside the "bubble" many expats stay within. You all know I'm pretty conservative, so don't take it the wrong way - I'm not in any way adventurous, but being here on my own has forced me to "localize" pretty quickly to keep myself entertained and avoid boredom / being homesick. Luckily, there is a lot of "new" to explore and experience in Singapore and this weekend was evidence of that! Last week, a co-worker from Australia gave me a great book: an expats guide to Singapore called "Living in Singapore". It covers everything from advice on moving your personal belongings to Singapore, to regional travel, shopping, etc. It's a really great book and I've recently found it both a humorous, entertaining read as well as a great reference. As a result of some of the advice in this book.....my weekend included a reluctant introduction to "bubble tea" (bottom picture on the left), dinner next to a wall of fish tanks full of sea cucumber and giant Australian crabs (some of which found themselves on our plates), a visit to the local wet market, a round of golf, meeting new neighbours, consuming green beer (said to have medicinal qualities from a plant called spirulina), and a visit to a very unique park called Haw Par Villa. I have to save a few of these stories so I have something to talk about with everyone when I get home......but I'll continue to share some of the more unique experiences on a weekly basis. 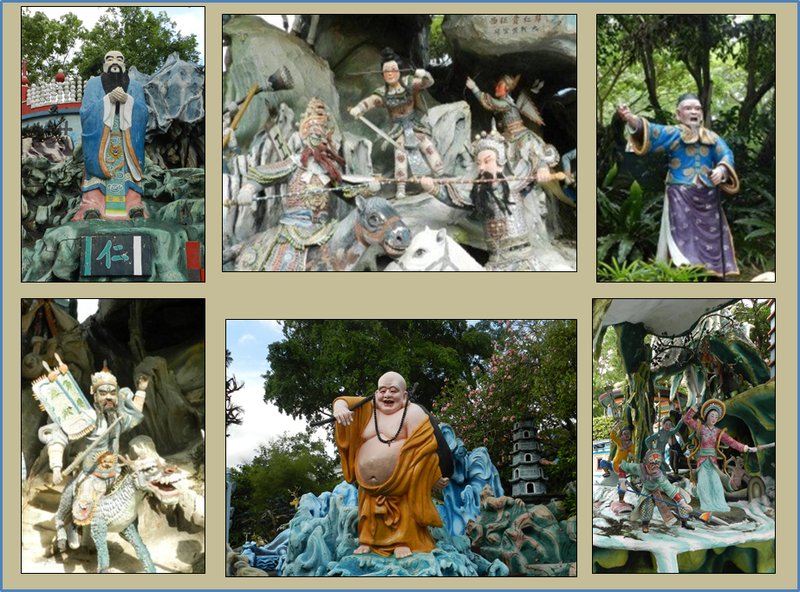 For this week's update, I have to share my experience at the later - the oddest / most interesting place I've visited so far, Haw Par Villa. Haw Par Villa (Villa of the Tiger and Leopard), originally known as Tiger Balm Gardens, was built in 1937 as a private residence by Aw Boon Haw, one of the founders of Tiger Balm, now sold in the US and worldwide. The property was later converted to a park with over 1,000 colorful statues intended to teach Chinese values, folklore, history, and Confucian ideology. The statues on display include animals, sumo wrestlers, Chinese gods, A Statue of Liberty (yeah, that confused me too) - and, well........just about anything else you can imagine. In most cases, the statues are part of a "scene" depicting a historic or legendary Chinese battle - or depicting some crazy folklore.....usually involving some half man / half beast Chinese character. The most unique and disturbing area of the park is the "Ten Courts of Hell" exhibit (which puts my last post about the laws and fines of Singapore in perspective) - more to come on that. The park is located just steps from the aptly named Haw Par Villa MRT station, making it a very easy place to find. Admission is completely free - which is odd considering you have to pay extra for a napkin at most restaurants. Anyway, at Haw Par Villa, just like most miniature golf courses, the statues were not necessarily built to withstand the climate for an extended period of time, and some are beginning to show signs of age. Still - as decorative and colorful as everything was, I was amazed how many remain in very good condition. Let's just say that the attention to detail displayed outside in the rest of the park was also exhibited in the Ten Courts of Hell. Each "punishment" was on display in graphic, colorful sculpture....definitely not something Cooper and Sophia would have enjoyed. 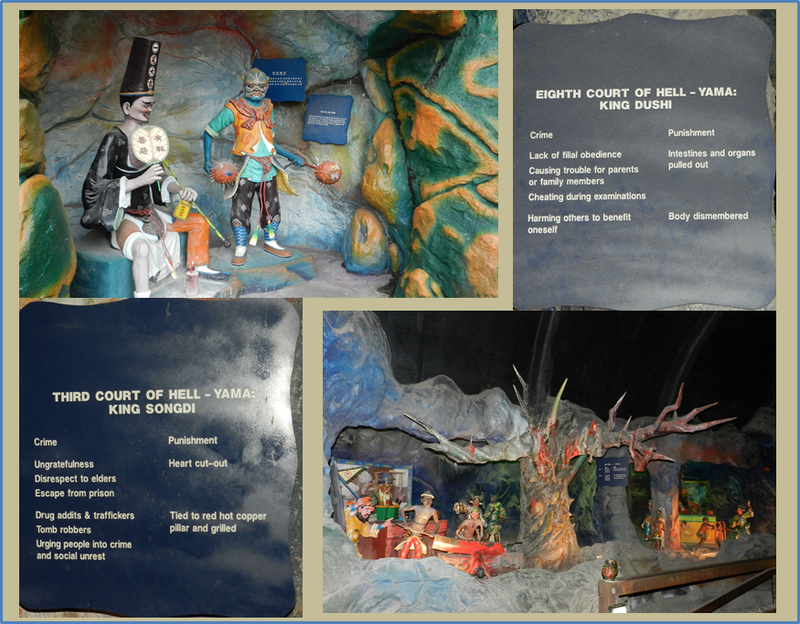 Anyway - after completing my tour of the first Nine Courts of Hell, I was relieved to find that the Tenth Court was the Wheel of Reincarnation.....a somewhat happy ending to an otherwise disturbing view of Chinese cultural beliefs of hell. I hope everyone is doing well - I'll see most of you in 23 days!